Brad M. Carlson (born June 12, 1950), better known by the stage name Bun E. Carlos, is the original drummer for American rock band Cheap Trick. He was the band's chief setlister and archivist, and maintained recordings of all the band's shows, some of which have been released under the title 'Bun E's Bootlegs'. Carlos has two side bands with former Cheap Trick bassist Jon Brant: The Bun E Carlos Experience, and the Monday Night Band. Carlos is left-handed, but has alternated between left and right-handed playing throughout his career. I'm still involved in the business of Cheap Trick, so I keep my eye on that kind of stuff. Every musician in the known universe has signed a bad piece of paper, myself included. But it's really very simple. You're the artist. It's your picture that's going on the CD cover, nobody else's. Protect yourself. Get a good lawyer. You'll kick yourself later if you don't. You just can't walk into a venue, sit behind your drums, and expect to play a great show. It'll never happen. I don't miss going to airports and hanging out in hotel rooms. In April of 1976, Epic Records was flying out to sign us when I tripped over a light case after a gig and broke my arm. We called the next morning and said, 'Don't go to the airport - Bun E. broke his arm.' They thought Mercury or someone was trying to sign us, so they offered us, like, $25,000 more on top of the deal. I play every day. I had a bad back, but they fixed it. The last thing you want to do is play a long gig on a hot night, pass out, and wind up in a hospital emergency room. I practice every day and that kind of stuff to maintain my musicianship. We were offered 100 'Sgt. Pepper' shows in Las Vegas with a huge back-end. The music speaks for itself. You either like it or you don't, or you're somewhere in between. That doesn't change whether I'm in the band or not. 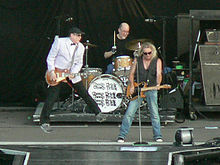 I'm a full member of Cheap Trick in all respects. Solely as an accommodation to some of the band members, I reluctantly agreed to take a temporary hiatus from touring. Before signing any contract, you have to assume that the guy on the other side of the desk is handing you a shifty piece of paper that works to his advantage. I know that sounds cynical, but it's really that simple. I don't like doing 25 songs. I think that just kills the audience. I think the show should be 17, 18, 19 songs and encores.